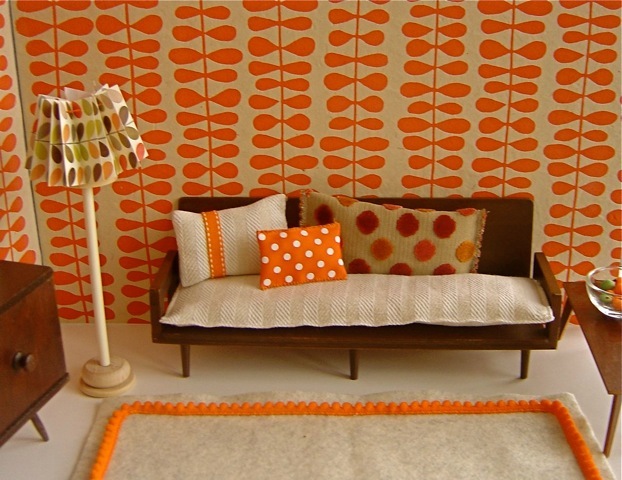 SOFA: A fabulous Mattel sofa with the tapering, spindle legs so fashionable during the 1950's-1970's. It's date stamped 1963 on the underside. SIDEBOARD: More fantastic period details adorn this piece, made by the top-quality manufacturer, Halls Industries in the States (alas, no longer in existence). Made from hardwood, it has tapering legs and two opening doors. On top sits a lovely glass vase filled with fake foliage. SIDE CHAIR AND COFFEE TABLE: An unusual, hand-made, tripod chair from the same period, crafted from wooden laminate, as is the coffee table - both, we believe, from the same maker. On the table sits a modern glass bowl with oranges and apples for dolly's snacks. LAMP: A wooden and plastic standard lamp with hand-made pleated lampshade - the latter made from modern wrapping paper. 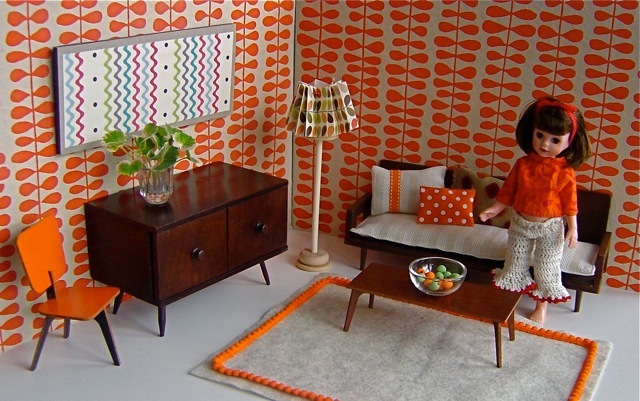 RUG: Hand-made from a piece of beige felt, featuring orange bobble trim. 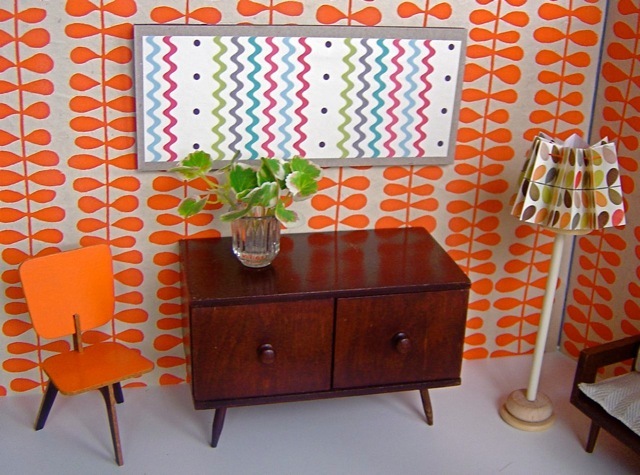 WALLS: Covered in modern, hand-made wrapping paper from Nepal. It has been mounted on two A3 pieces of 5mm thick foam board. Each piece of foam board measures 42 x 29.5cm or 11 5/8 x 16 3/8in. Dolls: Chosen from our selection of vintage dolls. Shown here, a Kripplebush Kids doll, made in the late 90’s. Price: £50.00 with her hand-crocheted bell-bottoms and print top, but also available without these clothes. Note that there are lots of other clothes available for this doll – please see the CLOTHING section of our website for an idea of what is available.